Reading the Summary on its own makes it look like an easy decision to provide the developer whatever they ask for in supplements. I'll temper that emotion by providing the text to an email I sent this morning when replying to one of a number of residents that contacted me about this. When going forward it is important that the City makes informed decisions on how much to supplement the developer. The gathering of that information is still underway. Whether the city provides a $22,000 per lot supplement like was done when the first houses were built, a $15,000 per lot supplement like was done a couple years ago, an $8,000 per lot as asked for this amendment or no supplement should depend on what is needed to ensure we are progressing efficiently to provide all the amenities we need and many of the amenities we desire here in the City. Growing at the right speed and magnitude is important for the City, the Bethel School district and the Carriage Trails neighborhoods. One of the reasons we provide the supplement to this developer is because the city initially borrowed $8.5 million to build the parkway. The seed money for the original agreement was suppose to help jump start the development so that the parkway debt could be paid. Ten years later the city still owes $6.5 on that debt and has through the previous 16 amendments borrowed another $11 million hoping to get into a position where the original loan can be covered. I hope you see there is a balance that needs to be achieved in order to ensure the long term success of both the City and the development. Obviously, the city would be in much better shape to pay off the very large amount of debt we have already undertaken if the neighborhood was attractive enough that people would purchase the homes there without the discount available because of the city supplement. But we also have to take into consideration the concerns of the developer that houses might not sell there without government assistance. I understand there is a tight balance that will have to be achieved with the decisions going forward in order to make sure the development continues and the City remains financially viable. The more information we gather to help us understand that balance the more likely we will be able to make sound decisions. Your thoughts and inputs are invaluable in this process. I'd appreciate your looking at all you can find on this issue and providing your thoughts in the comments below. Is there not also a loan which the city has on its books for the entire plot of land which Carriage Trails is now being developed on? Is that loan currently being paid by DEC while development of the community is ongoing? There are three top level categories of borrowing done for Carriage Trails. 1. The borrowing done in order to build the main boulevard. 2. The borrowing done for the special assessments done to help build the spur streets 3. The borrowing done to pay for the spur streets that will be paid by TIF revenues. The one I think you are referring to in your question would be for number 1 above. So I'll speak only to that in this reply. Originally a developer (The Kendal Group aka Benchrock) came to the City and said that if the City would borrow money in order to build Carriage Trails Blvd then the City could put liens (special assessments) on the acreage there and Benchrock would pay off the loans over time as additions to their normal tax payment. The concept is that as they created more housing lots they would assign a small portion of that large bill to everyone that bought a lot. That company went bankrupt. When DEC purchased the land out of bankruptcy it came with the liens still attached. In one way or another DEC has either paid the liens or the people that purchased lots created since they started the development have paid the liens. Ashley… By all means disagree with me, i expect many to do just that. That's why many of us have fought for freedom to give all the opportunity Â to speak. It's unfortunate what happened at your previous Â residence; however, I am not advocating for the city not to pay but I would like them to make sure it's the city's best interest first and that's what I think they are doing, gathering information. Â The city hasn't said they are not going to pay the money, to my knowledge, they are only gathering information to hopefully make an informed decision. Chad, as a fellow resident of Carriage Trails, I have to respectfully disagree with your position. We, as residents, just don't have enough information at this time to determine whether or not discontinuing the subsidies to carriage trails is a wise decision or not. You (and the council) place a large burden of proof on the Residents and the Developer to prove why the continued (much diminished) subsidies are necessary. I think the City and the Council must also be held to this same level of scrutiny. If each and every resident of Carriage Trails is taxed similarly to my family in 2015, then the community as a whole should presently net the city, conservatively, over $1.5M per anum. Keep in mind, this is current residents only, and that each additional household sold raises tax revenue to the city. In addition, this rough number doesn't take into consideration sales tax or business revenues driven by the increased traffic to Huber Heights restaurants, retail stores or entertainment options. In fact, if each of the new residents in the proposed amendment were taxed like my family, their income taxes alone would pay off their subsidies in less than three years. I recognize that there are infrastructure and upkeep costs associated with the neighborhood and these incomes are not 100% disposable to the city – but the fact of the matter is that Huber Heights as a whole benefits from the additional tax revenues and the additional business incomes brought to the area by Carriage Trails. Out of morbid curiosity, I would be interested to see what the projected financial state of the City would be if the Carriage Trails development had never been started, and if the City had merely held onto the debt accumulated by the Benchrock Project, slowly paying it off. As a resident of the community, I truly wish I had a greater level of confidence in the City's support for the development of Carriage Trails. Unfortunately, the city has a proven track record of driving development out of town, or at the very least, making deals that do not come to fruition. For all the talk of wisdom and prudence (Which I am all for! ), they do not seem to have much room to maneuver in their current situation. The city has not presented, for example, a back up plan to their posturing that they are going to discontinue their agreement with the developer. There has been no public mention of another developer waiting in the wings to take this project on. The City has also not described what would happen if the developer abandons the land and what would happen to the debt associated with the real property involved. Would the City take that debt back on? It is also important for us as impacted citizens to know how the deal was originally negotiated with DEC. Were the subsidy amendments negotiated ahead of time, enabling the city to unilaterally enact them, or are they structured to be negotiated based on project actuals and proposals from DEC throughout the course of the contract? That is, although they have "technically" met the existing terms of the contract – is the City backing out of a pre-negotiated agreement with DEC, or are they truly in a position to "take stock" and evaluate whether continuing to subsidize Carriage Trails is really an option? I don't think we can answer that question unless we have seen the text of the contract itself. I have previously lived in a development where the developer abandoned the project. We were left with higher HOA fees than anticipated and unfinished eyesores in the form of poured foundations that were never built upon and roads and fire hydrants to nowhere. When a new developer did come onto the scene – they built only apartments, which further depressed home values. People might have their problems with DEC, but mid-development you are sometimes better off with the devil you know. The reason our HOA fees increased at my previous residence is exactly why Carriage Trails HOA fees would go up if a developer abandoned the project: We pay HOA fees based on a completed neighborhood, and the Developer currently pays the HOA share of unfinished homes, roughly 1400 more than currently exist if the plan is for 2,000 homes total – Therefore, the cost of maintaining the same amount of green space divided by existing homes is much larger than our current annual payment – even if we were to negotiate a more favorable mowing and maintenance contract, it is extremely unlikely to offset the distributed cost of 1400 additional home sites. Will they quadruple? Maybe not, but they will most assuredly rise. Furthermore, the financial burden that Mayor McMasters describes is not going to go away simply because the city stops new subsidies for Carriage Trails. 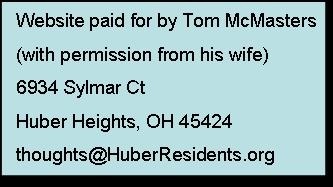 How long before disgruntled citizens south of 70 decide that those in North Huber are not "paying their fair share" for the debt "incurred against their own neighborhood" and start pushing for tax increases because the development halts and the neighborhoods never realize the tax potential the city was promised? Is this speculation? Yes. Is it entirely unjustified? No. The City must also remain cognizant of the types of communities that Carriage Trails is competing with for residents. In a geographical region where many people work at the base or further south, Carriage Trails has longer commute times and less amenities than most of those other neighborhoods. Rising costs will drive homebuyers south where they have more options. In the last six months, three people in my office and one family member have purchased or built new homes. Although I promoted Carriage Trails to each them, three out of four moved south, and one purchased property in Bethel Township itself. Carriage Trails is growing, but it fights an uphill battle of convenience and amenities every time. Will people be willing to forgo those preferable commute times and amenities for a higher home price? We'll see. Finally, I simply feel ill-used by the City. As a household of young professionals looking for our "forever home," we could have chosen to move anywhere in the Miami Valley. There are great homebuilding options available in Miamisburg, Springboro, and Beavercreek, or we could have purchased land and built in Bethel Township proper. We decided not to do that – in part because the subsidies made Carriage Trails so affordable, but also because the community was growing and thriving, and because of the promise that the kinds of amenities that make Miamisburg, Springboro and Beavercreek so appealing would soon be coming to Huber Heights. We wanted to invest and believe in the community that was being built. We took a gamble on that decision paying off. Right now I feel a little bait-and-switched, and I'm fairly certain that I'm not alone. I would love to be proud of my community, and I would love to see Huber Heights become a thriving, vibrant place! Please don't shut down the very opportunity it has to become more relevant in order to save a few bucks in the short term! Do I want the city to make wise financial choices? Of course I do! No one wants their city to be millions of dollars in debt! 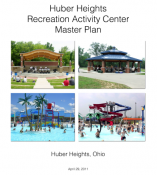 At the same time if the city of Huber Heights ever hopes to pull out of the debt ridden situation they find themselves in, they need the higher tax-paying homes and greater discretionary spending capabilities that Carriage Trail residents are bringing to the community. I hope that the Council, and the Developer are able to come to a mutually beneficial understanding that will foster further development and propel Huber Heights into the future. Where are the special assessments which will be paid by each homeowner of 20 years in the assessment of revenue from Carriage Trails? That Generates ~$760/household annually ($15,000) over the life of the assessment(s) and is to offset cost of extending utilities throughout the development. An example of why the HOA fees could go way up. In the 2014 HOA budget, the expenses were $468,814.61. The total fees collected from all properties was only $92,584. The developer was essentially paying $375,000 as a subsidy. Of course some of this is essentially going back into his own pocket because over 80% of the budget is for landscaping. So, while it is true we possibly could get a better deal on landscaping… is it going to replace that huge subsidy?